This is part of my slipcover series, go here to start from the beginning. 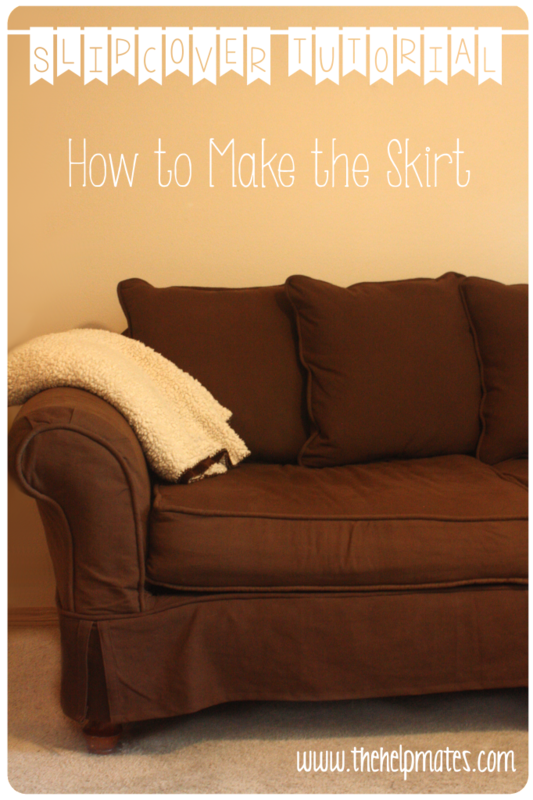 Cut the 6 large pieces the length of the side of your couch (plus 3-4 inches for hemming), and a height that will reach from the bottom of your couch to the ground, or from where your existing skirt starts to the ground. 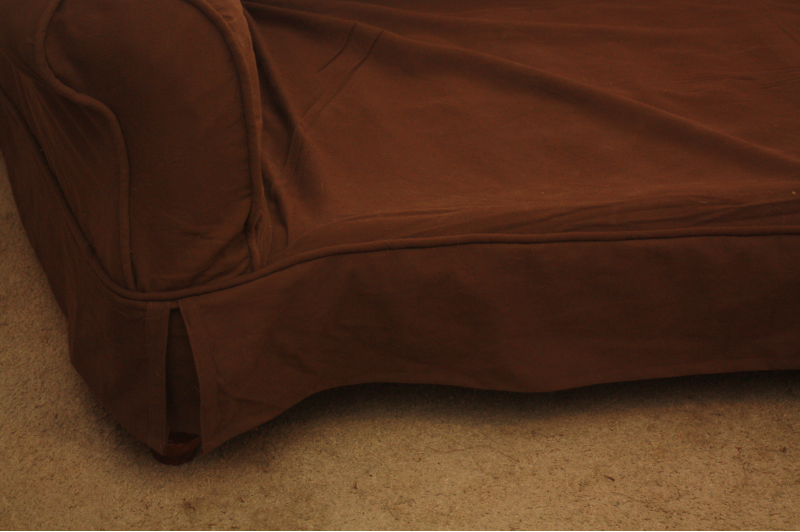 My couch doesn’t have a skirt to begin with, so I just measured from the bottom of the couch to the ground to make sure that the skirt can be hemmed and still hang down far enough. Be sure to account for the inch or so of seam allowance where it will meet the body of the slipcover and a few inches for hemming. Also, it just worked out that the length of the side of my couch was half the length of the front of my couch. You should measure to make sure that two pieces that size will stretch the length of the front of your couch. The four small pieces will need to be about 10 inches wide and the same height as the large pieces that you just cut, and you will also need to make a piece of piping long enough to go around the front and both sides of your couch. You’ll want to pin the smaller panels so that they will hang behind the larger panels where they meet. 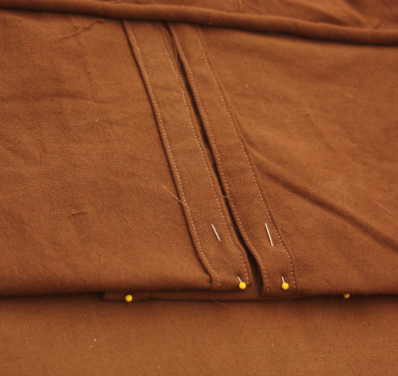 Sew the skirt panels to the piping. Now, you’ll want to put the body piece on the couch right side out. 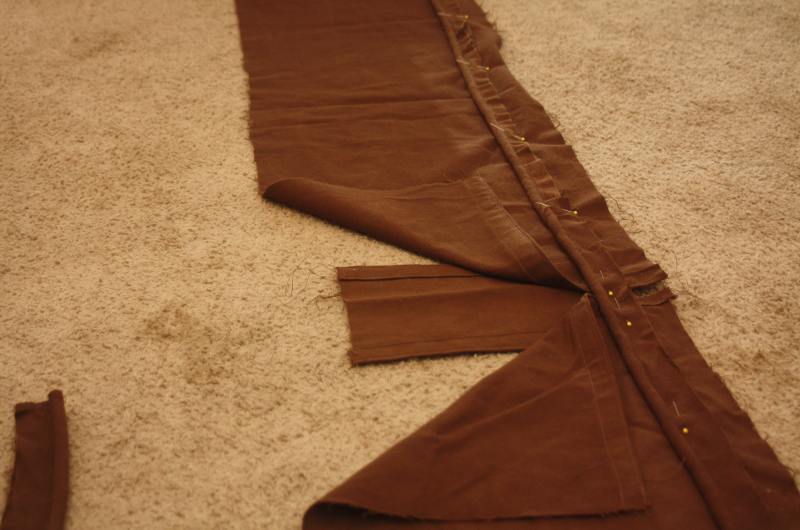 Then pin the skirt piece in place, and try your best to match up the corners. Mine turned out a little off, but it wasn’t enough to worry me. 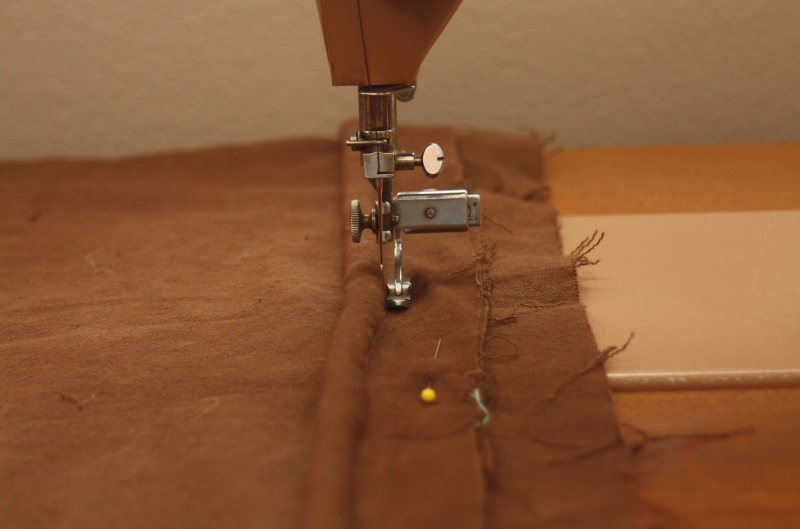 Sew the skirt to the couch body. This will be a little slow going, since you have to work with a giant piece of fabric, but don’t worry, we’re almost done with this couch! 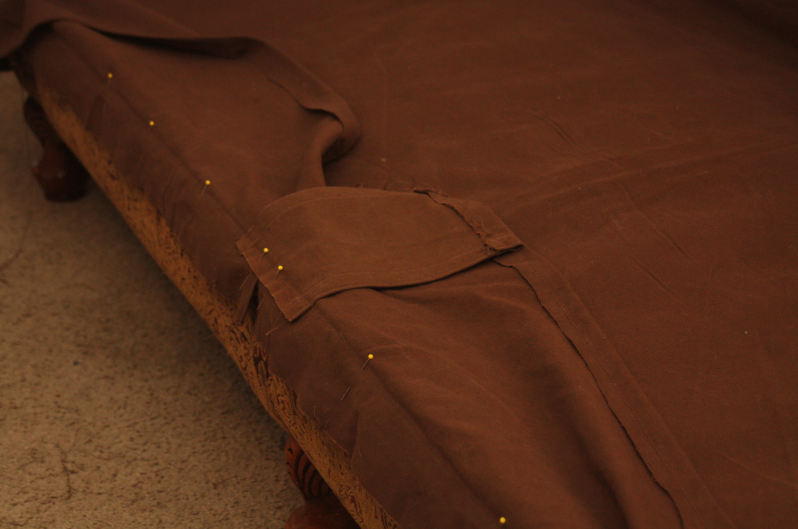 Now that the skirt is sewn on (minus the back), put the cover on the couch to make sure it looks right. Here you can see that my corners were a little off, but it didn’t bother me enough to fix it. Now we’re ready for the back part of the skirt. Cut two pieces that will cover the back of the couch and meet in the middle like the front, but make them long enough to stretch a few inches around the corner of the couch. I added maybe 5-6 inches extra to my back panels. They’ll need to be the same height as the rest of your skirt panels. 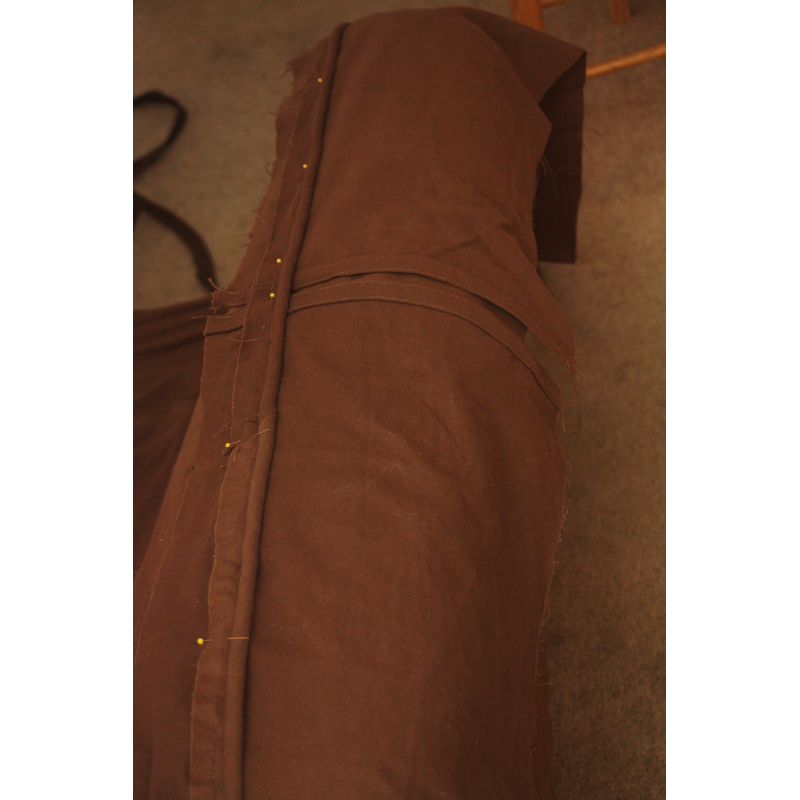 Also make some piping long enough to stretch across the back of the couch plus about 8 inches. 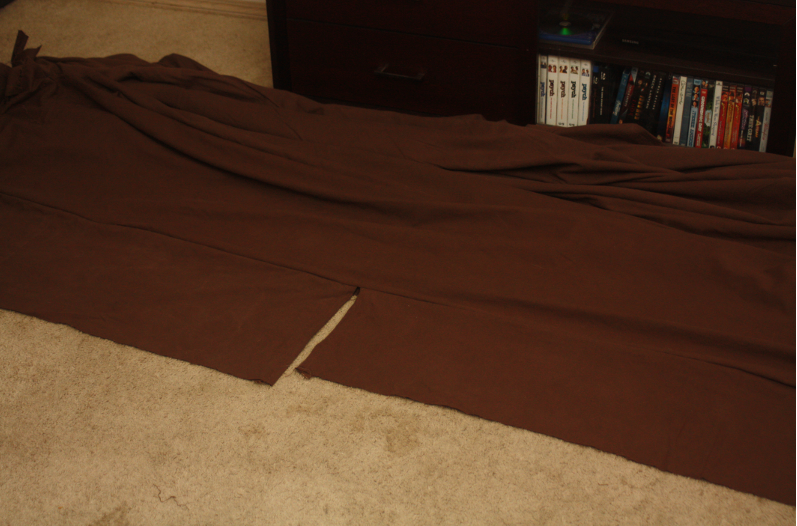 You’ll need to hem both sides of the smaller panel and just the inside edges of the larger ones. 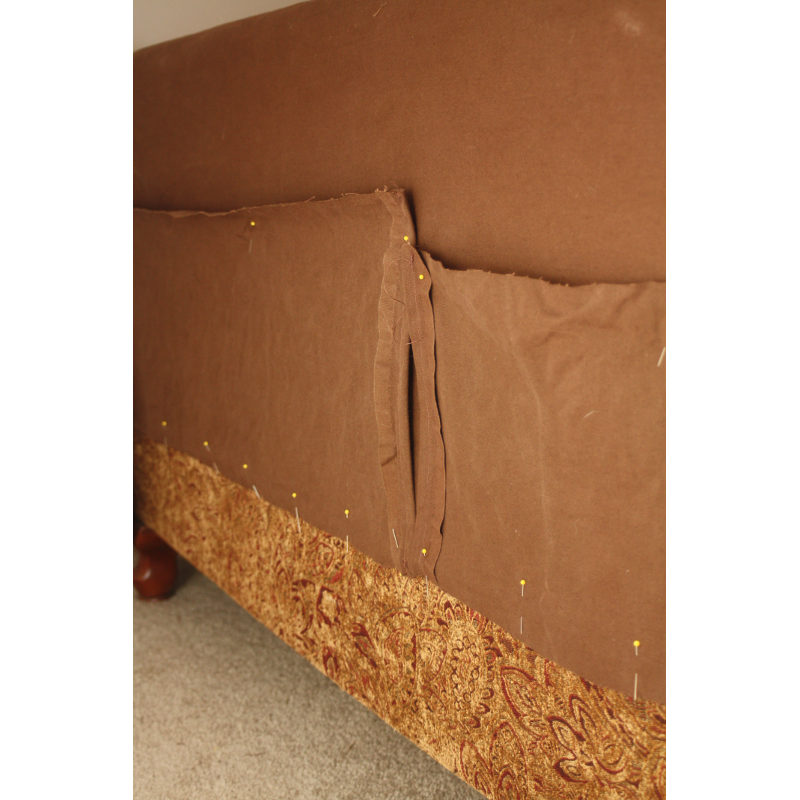 Leave the part that will stretch around the couch corner unhemmed. 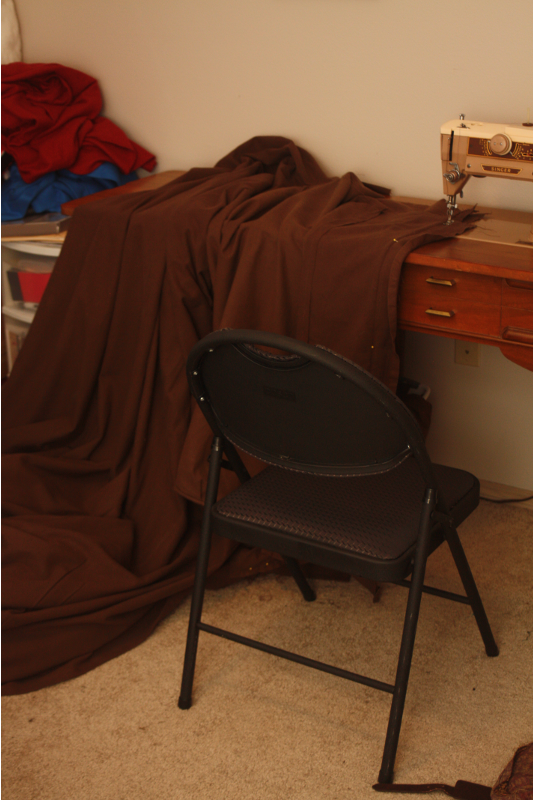 Sew the two large back panels and your last small panel piece onto the back piping pieces, and then onto the couch piece the same way that you did for the front, centering them where they meet in the middle, with the smaller panel hanging behind the larger ones (mine were really uneven). Here you can see (aside from our Psych DVD collection) my slipcover after I sewed the back panels on. I didn’t add the small middle panel until later, but I think it’s a good idea to add it with the rest of the skirt. 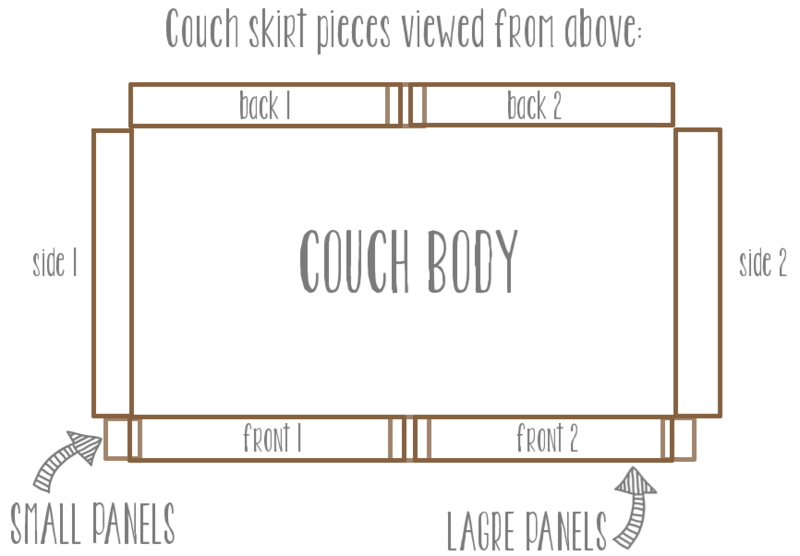 Now that you have all of the skirt panels attached, you can put the cover onto your couch right side out and mark where you want to hem the bottom edge of the skirt. Then hem your little heart out, and now you’re ready to put the finishing touches on your slipcover! Check back next Friday for instructions on finishing the cover. When you move to Kentucky, I want you to come to visit and I will pay you to help me recover a couple of wingback chairs. The project really intimidates me.